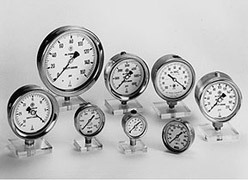 The highest quality pressure and vacuum gauges available. McDaniel Controls pioneered the use of all stainless construction, jeweled movements, safety glass lenses and glycerin filling, totally revolutionizing the industry. Many models are repairable, and all McDaniel products provide unsurpassed value. We have the ranges, sizes and mounting styles to meet your needs! In typical applications, McDaniel gauges provide 5 to 10 times the service life of other manufacturers and often at a LOWER cost! Helpful Information - Selection - Chemical Compatibility - Pressure Units Conversion - High Temperature Applications - Etc.